The Motorola DROID Turbo was one of the top spec'd Android handsets when it was released last year. The phone's 5.2-inch screen (with a 1440 x 2560 resolution, and a 565ppi pixel density) offers users a sharp, enjoyable viewing experience. To protect DROID Turbo owners, Verizon promises to cover a free screen replacement for two-years after purchase. Previous rumors suggested that this would not be necessary with the sequel to the DROID Turbo, since the device was said to come with 'shatterproof' glass. A Verizon brochure leaked today, confirms that this is true. The brochure shows the new Motorola DROID Turbo 2 with a heading that reads "Meet the world's first shatterproof screen." According to the brochure, Verizon will give you $300 off the price of the handset, when you trade in another smartphone (even if it has a cracked screen). The $300 appears as an account credit, or in the form of a gift card. In addition, the DROID Turbo 2 will be offered on the Moto Maker site, where it will have over 1000 different design combinations. And those purchasing the 64GB model will be allowed one design refresh. Also shown in the brochure is the Motorola DROID MAXX 2. Verizon is offering the same $300 promotion for those bringing in a working smartphone to trade in. The only difference is that since the DROID MAXX 2 doesn't have a shatterproof display, the trade must have a pristine screen. The DROID MAXX 2 will once again feature up to 48 hours of battery life. The brochure shows removable shells available for $19.99, and a Case-Mate Naked Tough case priced at $34.99. 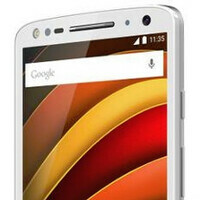 We expect Big Red and Motorola to unveil the new DROIDs on October 27th, at a media event in New York City. If you have a thing for the Motorola DROID line, circle the date on your calendar now. At that time, we should find out information about the pricing of the phones, and when they will go on sale. The DROID Turbo 2 is the Moto X Force, only a Verizon exclusive variant of it. If you live in the U.S., this is the model you will buy if you want the Force to be with you (couldn't resist, sorry). Regards, Alan F.
Hahahah good one! I know that, but what I meant is that I am waiting for the X force in The Netherlands. Seems like the best allrounder. On my DROID Turbo, it is on the back just above the DROID branding., Had I bought the 64GB model, it wouldn't be on there at all. Regards, Alan F.
Ugh. Verizon and your Droids. Please. Be gone already. It's faint, but the old check mark really is there on the bottom front of the phone in the first photo/second page. Oy. Verizon tramp stamps ruin the phones looks and design. It's a shame. Shatterproof screen, huh? Bring on the drop tests!